There must have been music playing when my Dad came into the world. I can remember my Grandpa Jack always humming and singing, so I’m certain that my dad grew up surrounded by music. And then he gave that gift to us – he sang to me and to my sisters when we were children and gave us this wonderful gift of music. He lived his whole life like a song. To me he is like a folk song – a beautiful melody, purposeful lyrics, passionate, rhythm, harmony. Even Dad’s speaking voice sounded like music – deep, gravelly, unique, a tone of its own. You knew his voice when you heard it and it was wonderful. Those who knew my Dad learned to appreciate his wit and his wise-crack sense of humor. He couldn’t resist a good joke – sometimes mumbled under his breath to those of us close enough to hear. There was the time in 2006 in Ireland when, after receiving enough blood transfusions to replace all of the blood in his body, he wrote a letter to the Irish Prime Minister requesting that he be granted honorary Irish citizenship now that he was a full-blooded Irishman (the humor was lost on the institution). He also got joy out of making us squirm when we were little girls, asking the mannequins at Macy’s for directions to the pre-teen department or breaking into an over-the-top version of “Hopelessly Devoted to You” on a random street corner. “Da-a-a-d! !” “Huh? What??? ?” and then that smile. Then there was Mr. Light. Mr. Light lived in his car and talked to us in a language only my dad understood and could translate. Mr. Light miraculously knew where we wanted to go for dinner (the purple Yet Wah? Again? ), and he knew when the traffic lights were going to turn green. We spent years trying to find the “trick button” in my dad’s car that turned Mr. Light on and off, and very unsafely made my dad drive with both hands in the air so he couldn’t touch anything…but still Mr. Light kept talking. Blink, blink – hello girls (dad’s voice). Blink blinkety blink – pizza for dinner tonight? My dad kept this up for years and never tired of it….that was his tenacity, that was his way. He kept at things. I can imagine him sitting there with his hands up in the air, pressing wherever that darn button was…thinking, “Wow, wouldn’t it be amazing if years from now the girls still remember this?” I can imagine him there, consciously crafting a memory. Dad, you did it, you always did. 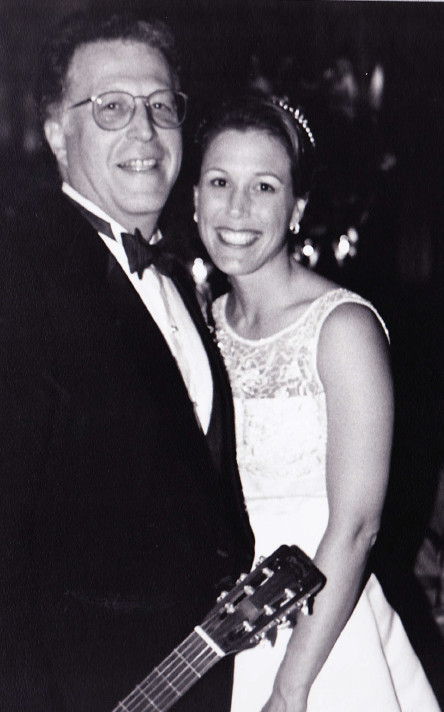 My sisters and I debated whether to talk about Dad’s 14-year long battle with myleofibrosis –we wanted to focus on all of the happy, positive times. Yet, this battle was such a huge part of his life these past years, and the way he confronted this enormous challenge reminds all of us of the stuff he was made of. Karen summed it up well – she said he fought with tenacity. His will to live was palpable and he took it on with the full force of his being. Let me share a story that will highlight what I’m trying to say. And then there was, quite simply, his love. Quiet, unassuming, unimposing love. Always there like an anchor, but never expecting anything in return. Watching him watch Karen, and watching how they loved each other – it was palpable, the pureness of it, the kind of love that poets ache over. And the way he loved me and my sisters is a gift I will carry always. And then, it all comes back to music. I used to sit and watch my dad as he played the guitar and sang with us, how his fingers moved so elegantly and effortlessly across the fret board. When I learned to play, I only wanted to be able to make the same music as my dad, to evoke those same feelings. I listened, Daddy. I heard you then, I hear you now. I know that God is smiling on me, I feel the warmth of your love, and I will hold this beautiful gift you have given to me. I will cherish it beyond my own days, as I will pass it along to my children, and to their children, and on and on. You once sang, “Life is like a circle,” and now it is my duty and my honor to keep the circle spinning. I love you, Dad. Karen asked me to read a passage from one of her favorite poems by Mary Oliver, University Hospital, Boston. Karen has been reading this poem throughout the past many years, and she feels this describes her experience of caring for, and loving my Dad. Her strength and fortitude is something I am in awe of – her unwavering dedication, her love for my father carried her through a pain that I can’t come close to imagining. We will continue to love each other, we will carry forward that joie de vivre that my father had, and the love he had for all of us. The despair of the mind. I turn and step inside an empty room. Yesterday someone was here with a gasping face.